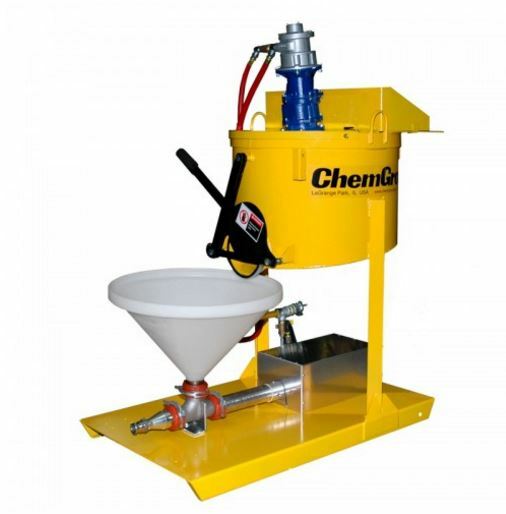 The ChemGrout model CG-550P is a skid mounted, air powered grout machine. This system is designed to provide a continuous operation of mixing and pumping. This unit features a 34 gallon (129 liter) mixing tank and the field proven CG-050 grout pump. The mixer is equipped with baffles, bag breakers and variable speed high-efficiency paddles that provide a rapid mixing cycle. The tank outlet valves are large slide gates that allow the thickest materials to fall easily into the pump hopper. The holding hopper is connected directly to the suction of the grout pump to provide a continuous pumping operation. The grout pump is a 2″ positive displacement, pulsating piston. The rugged steel frame stands up to the toughest conditions on the job site. Operator controls are centrally located for efficient production. The pumping components disassemble without any tools for a fast and efficient cleaning. All components are easily accessible for operating, cleaning and maintenance. The pump comes complete and ready to use with a 12.5 foot grout hose and a set of spare piston cups.